Welcome to Leominster Sunrise Co-operative! We have installed a 91kW solar photovoltaic array on the new primary school in Leominster, Herefordshire. 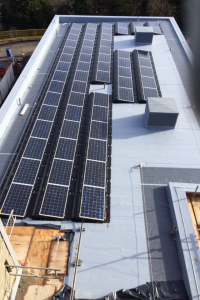 Its purpose is to generate as much solar electricity as possible for the school to use, to reduce their reliance on fossil fuel based electricity. It will also reduce the school’s energy bill by around £5000 a year. Owned by a local co-operative, the funds to install it were raised through a community share issue in 2014. The array was turned on when the school opened in early November 2014.